Haifa Diary: 4, 000th child saved by Save a Child's Heart! 4, 000th child saved by Save a Child's Heart! Sanusey and his family live in the small city of Brikama, Gambia, just south of the country's capital. At just three months old, Sanusey was diagnosed with a congenital heart defect. The surgery needed to repair his heart is not available in Gambia. After over three years of traveling back and forth to the local hospital for testing every other week, his doctor began looking for a way to get Sanusey the surgery he desperately needed. Thankfully, the Chairman of the Zionist Foundation UK, Paul Charney, stepped in and made the connection between Gambia and Save a Child's Heart. 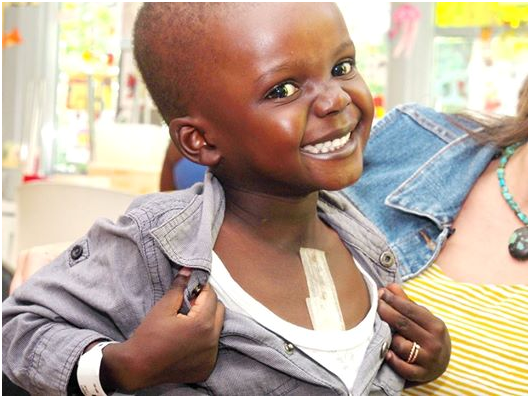 With his help contacting Ambassador Paul Hirschson at the Israeli Embassy, Save a Child's Heart was able to bring Sanusey and three other Gambian children to Israel for surgery. Sanusey arrived to Israel on Sunday, May 15, together with 12 other children from both Gambia and Tanzania. He was accompanied by his older sister, Penda, and stayed very close to her during the many hours of travel from West Africa. The next morning, Sanusey, along with the rest of the children, was taken to the Wolfson Medical Center for initial examinations. He waited his turn, walking hand in hand with a Save a Child’s Heart team member who had accompanied the group to the hospital, while making sure that his sister was never too far away from him. At the hospital, Sanusey became anxious, collapsed and stopped breathing. In a matter of moments, the whole medical team rushed to his aid in the examination room and began resuscitating him. It took over an hour and, fortunately, the medical team finally managed to stabilize Sanusey and he was taken immediately to the Operating Theater for emergency heart surgery to save his life. Dr. Lior Sasson and his medical team operated on Sanusey for hours. Penda sat in the waiting room, crying and hoping for the best. Thankfully, the surgery was successful! Only three days after his operation, Sanusey was sitting up in bed and smiling. He is currently recovering at the Save a Child’s Heart Children's Home in Holon. His contagious laughter bellows through the house as he plays with volunteers and the array of toy trucks and arts and crafts activities. He radiates confidence and it is a pleasure to see him play with the other children from all over the world, smiling, happy, and finally healthy. Bringing Sanusey to Israel for life-saving heart surgery would not have been possible without the help and support of SACH UK and SACH Switzerland, who connected Save a Child's Heart to the Sherman Trust who co-sponsored Sanusey's surgery, and Brussels Airlines, who helped sponsor Sanusey's flight. Thank you! Syrian Refugees vs. Palestinian "Refugees"